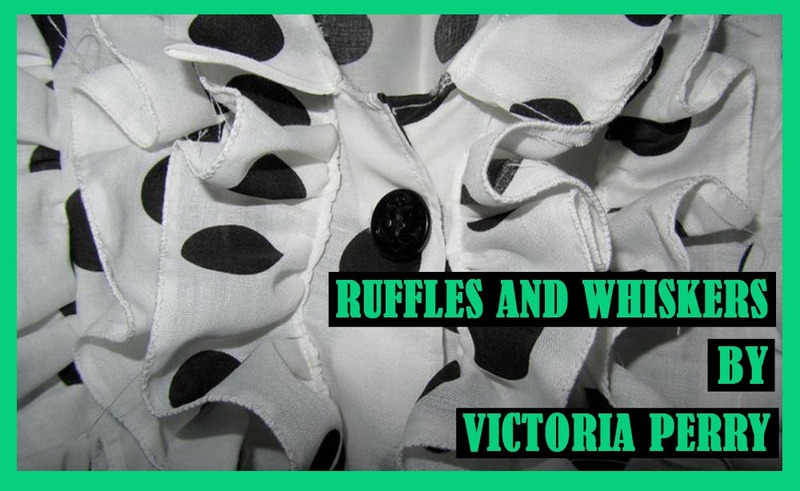 Ruffles & Whiskers: Quick Project..
Another week has passed, and I do have some news on the sewing front! In an attempt to get me out of this sewing funk, I am taking park in Sew Grateful, the challenge concocted by Debi (click here for the deets). I've selected what i'm guessing is a late 1980's, possibly early 1990's Vogue pattern that my mum picked up in a charity shop for me, but am a little undecided on which fabric to use. More details will be posted next week. However, in preparation for this I decided to set a small challenge to myself as I haven't touched my machine for around 1 1/2 months! Eeek!! I was given a black skirt by my sisters neighbour who decided she didn't want it, and thought I could do something with it. She was right. It was originally a size 20 (UK), so was rather large on me! I've simply taken the skirt in by adding some gathers, and re-sized the waistband. I've also given it a new button as the old one wasn't to my taste. I've still got to take the length up as it skims the floor on me, even with my long legs! I did toy with the idea of leaving it long as I don't have a maxi skirt, but my husband commented that I looked like a Victorian school teacher so I thought it might be best to lose a few inches from the hem! I'll post a pic at the weekend showing you the finished project!